CliftonStrengths 34 reveals your complete and unique talent profile -- all 34 CliftonStrengths themes in order based on your responses to the CliftonStrengths assessment. It also gives you proven strengths-based strategies to maximize your potential. This digital product includes one access code to complete the CliftonStrengths assessment. After you complete the assessment, you will receive your personalized CliftonStrengths 34 Report and supporting tools and resources, including the interactive "CliftonStrengths: Your Introduction" e-learning module and a digital copy of the bestselling book StrengthsFinder 2.0. CliftonStrengths 34 is for people who want to unlock the power of their full CliftonStrengths profile to live the absolute best version of their life. NEW! "CliftonStrengths: Your Introduction" E-Learning Module. This interactive e-learning experience is the first step on your CliftonStrengths journey. During this 20-minute online module, you will use your personalized CliftonStrengths 34 results to learn how you can achieve your potential by doing what you naturally do best. Redeem your CliftonStrengths 34 access code. 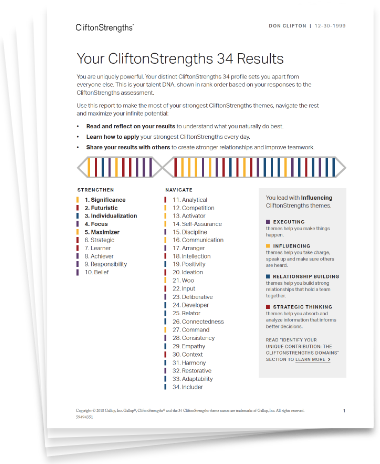 Start using your CliftonStrengths reports to maximize your potential.